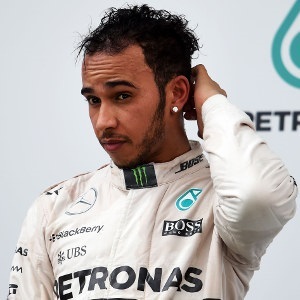 Shanghai - World champion Lewis Hamilton roared to pole position in Saturday's qualifying for the Chinese Grand Prix, just pipping Mercedes team-mate Nico Rosberg. Ferrari's Sebastian Vettel, who stunned the Silver Arrows to win in Malaysia two weeks ago, will start from third on the grid for Sunday's race alongside the Williams of Felipe Massa. Hamilton, who won in Shanghai for the third time last year, clocked the quickest time of one minute, 35.782 seconds to maintain his perfect qualifying record in the season's first three races. Rosberg lapped just four hundredths slower than the Briton and when informed he had narrowly missed out on pole, yelled over the radio: "Oh come on, guys!" The German then shook hands with countryman Vettel but blanked Hamilton as the top three posed for pitlane photographs. Hamilton has dominated all weekend, his only real discomfort coming from an overheating cockpit on Saturday, but Rosberg's pace should make for an absorbing battle in China. Vettel clocked 1:36.687 ahead of Massa and the second Williams of Valtteri Bottas as Ferrari failed to get both cars on the second row, Kimi Raikkonen only sixth fastest in smoggy conditions. Red Bull's Daniel Ricciardo and Romain Grosjean's Lotus were next and the Saubers of Felipe Nasr and Marcus Ericsson rounded out the top 10. However, there was more disappointment for McLaren as Jenson Button and Fernando Alonso languished back on the ninth row. Alonso, who ground to a halt in the morning's practice with smoke coming from his car, stormed past mechanics and into the garage after his latest setback while McLaren boss Ron Dennis stared grimly at his pit screen. Both Button and Alonso, suffering wretched fortune on his return to McLaren from Ferrari, failed to finish in Sepang to leave them without a single point in two races. Mercedes racked up 16 victories in 19 races last year and again pulverised their rivals in this season's opener in Australia, before Vettel stopped the rot in Sepang to end Ferrari's 34-race drought.